Brexit has created a wave of uncertainty rippling through boardrooms across the world that is triggering organisation and/or supply chain relocations. Many organisations are currently assessing whether or not to relocate their critical talent all together to a new country. It’s not only the Financial sector that is considering relocations of hundreds of employees to yet unknown EU countries, but organisations in other industries are also having discussions. This includes both UK and non UK headquartered companies – particularly those who have substantial investments in the UK, for example USA or Asia multinationals with European headquarters in the UK and financial institutions or manufacturers from all over the world. 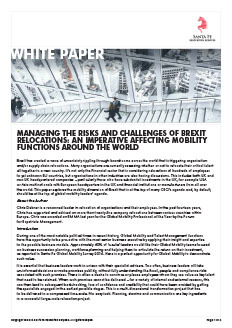 This paper explores the mobility dimension of Brexit that is at the top of many CEO’s agenda and, by default, should be at the top of global mobility leaders’ agenda.